Here's the boy version of the slider card that I posted yesterday. 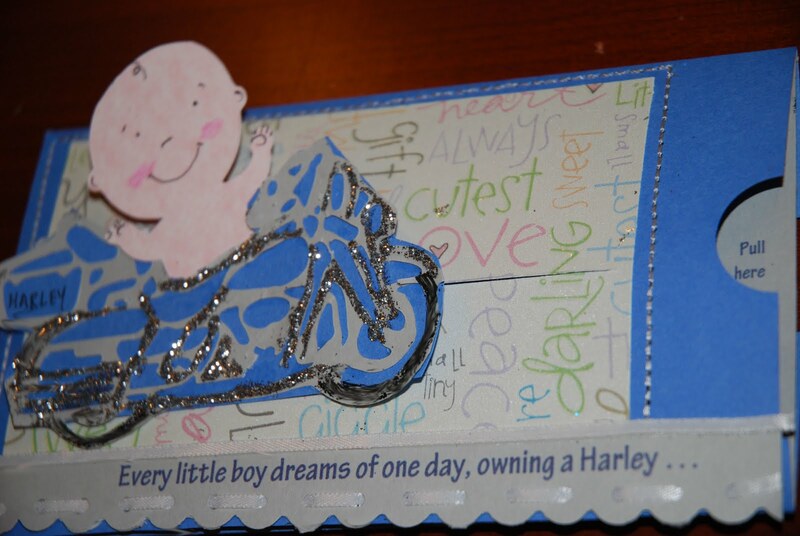 This little guy rides his Harley into the world. When you pull the tab, out pops a place to stash some cash. 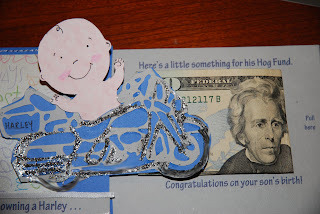 I also figured out that I could do more with embellishing the card -- like the double-stitching around the accent paper -- if I did so while the templated jacket was still flat and unassembled. Ahh, this should have been obvious ... I'm learning as I go! I'm also figuring out that I am over-working the cards. Once and done should do it. And I'm messy. Or is that called "creative"?? And last but not least, here is a vertical version of the slider card that I made to celebrate the birthday of my friend, Bunny. At left, you can see the card when it is in the "down" position. 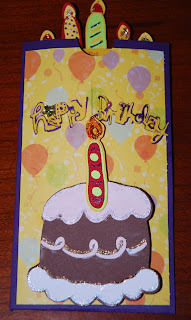 By pulling on the center candle, Bunny will be able to see the birthday message inside. 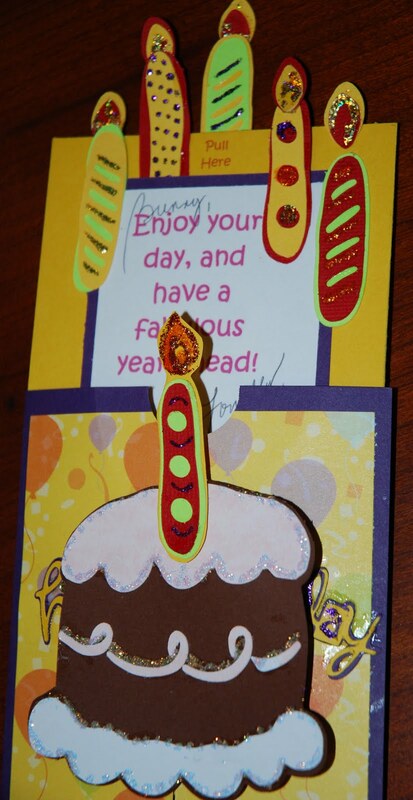 I planned on putting many more candles on the card but play time was running short. There was still housework to do this weekend! Egads! Incidentally, the flat dimension of the slider card folder (open at the top for a vertical card, or the right side for a horizontal one) is 4" x 7". 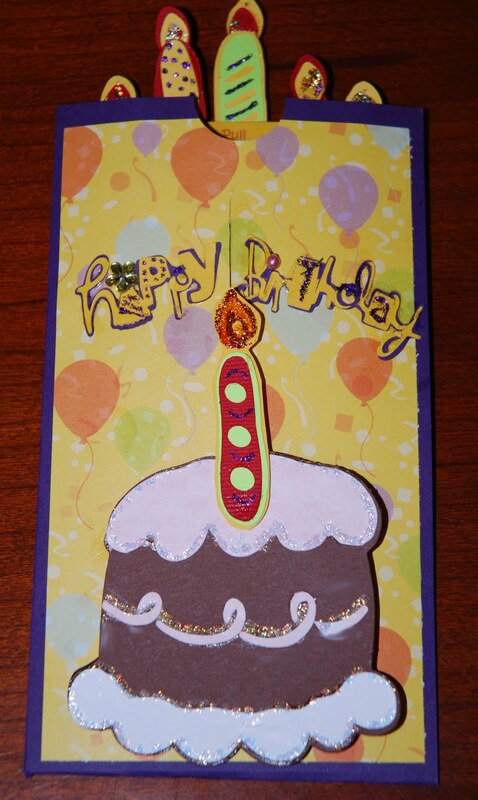 Embellishments off the opening make this card suitable for a #10 envelope. Off the sides, well, on to a custom envelope. Or no envelope at all when I hand these new Moms their baby cards. I hope you're making it a creative sort of day! My Creativity is Ever Blooming! Hold Onto Your Wallets ... It's CKC Time!